Air Liquide will build the first world-scale liquid hydrogen production unit dedicated to the hydrogen energy markets, located in the Western U.S., and has signed a long-term agreement with FirstElement Fuel Inc (FEF), a leader in retail hydrogen infrastructure in the U.S., to supply hydrogen to FEF’s retail liquid hydrogen fueling stations in California. Air Liquide expects to invest more than USD150 million to build a liquid hydrogen plant in the western United States, with construction to begin in early 2019. The plant will have a capacity of nearly 30 tons of hydrogen per day — an amount that can fuel 35,000 Fuel Cell Electric Vehicles (FCEVs). 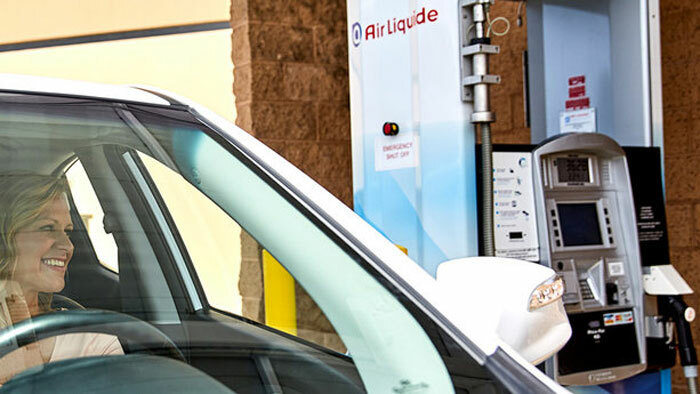 Through this investment, Air Liquide will enable the large-scale deployment of hydrogen mobility on the U.S. west coast, providing a reliable supply solution to fuel the 40,000 FCEVs expected to be deployed in the state of California by 2022. The plant will also support other fuel cell vehicle and transportation markets in the region, such as material handling and forklifts and heavy-duty trucks. The new plant is the first large-scale investment into the supply chain infrastructure needed to support hydrogen energy solutions for the energy transition, starting with transport and mobility. The pace of FCEV deployment has now reached a level requiring a growing scale of investment and is paving the way for the growth of zero emission mobility in other geographies. “This new investment in hydrogen production and our collaborative relationship with FirstElement Fuel, further demonstrate our long-term commitment to the development of hydrogen energy for mobility, and accelerate the deployment of new hydrogen fuel cell electric vehicles — cars, trucks, buses — planned by automotive manufacturers like Toyota, Honda and other leading OEMs. We are convinced that hydrogen is an essential sustainable energy vector of the future and a cornerstone of the energy transition,” said Michael Graff, executive vice president & executive committee member of L’Air Liquide S.A. and chairman and CEO of American Air Liquide Holdings, Inc.
“This signals a transitional moment for the hydrogen automobile market,” said Joel Ewanick, founder and CEO of California-based retail hydrogen station company, FirstElement Fuel Inc.
“The commitment to construct a hydrogen plant of this scale by Air Liquide and supply FirstElement Fuel with hydrogen for its fueling stations in California is a clear demonstration of the shared vision of global leaders like Air Liquide, Toyota and the OEM community to innovate, build and deploy the vehicles and infrastructure to enable clean mobility of the future,” said Jim Lentz, CEO of Toyota North America. “Honda welcomes Air Liquide’s significant investment in hydrogen refueling infrastructure for fuel cell vehicles. Their commitment will broaden the appeal of fuel cell electric vehicles and speed the adoption of this promising zero-emission vehicle technology,” said Steven Center, vice president, Connected & Environmental Business Development Office, American Honda Motor Co., Inc.